Should I use an Overview or an Intervention Review? Authors who wish to compare multiple interventions in a single review may choose to do so using either a Cochrane Overview or a Cochrane Intervention Review. 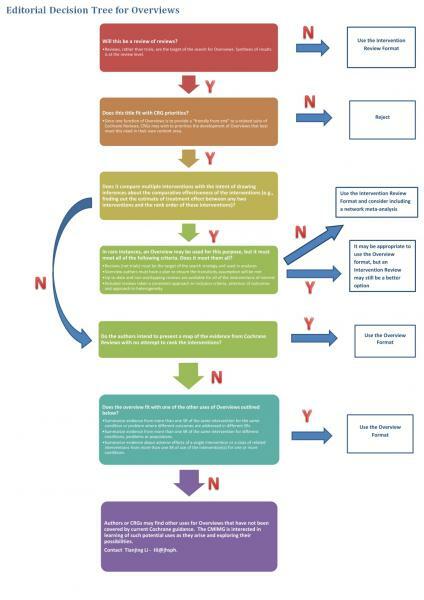 We have developed an editorial decision tree (Click here to download a copy) to help guide prospective authors in this decision. The decision tree was produced by the Comparing Multiple Interventions Methods Group (CMIMG) with funding from the Cochrane Methods Innovation Fund and reflects the contents of a new set of recommendations which will be incorporated into future editions of The Cochrane Handbook. We have also produced a background paper explaining the rationale for the new recommendations and the steps in the decision tree. We have produced a protocol template for a Cochrane Intervention Review that compares multiple interventions.